With less than four weeks to go until Election Day, all candidates have now issued or updated their manifestos so we take a look at how much difference – or perhaps how little difference – there is between them. Prince Ali has updated his previously 15-page glossy from the 2015 election campaign to a 24-page glossy. It is based on two game plans: restoring the credibility and reputation of FIFA (a catchphrase often used by #NewFIFANow), and serving football and the member associations. Simplify the development application process and “depoliticise” development – an interesting comment considering that the two countries that have received the most development funding in the years 1999-2014 are Bahrain (home of his Asian rival, Shaikh Salman) and Jordan respectively. 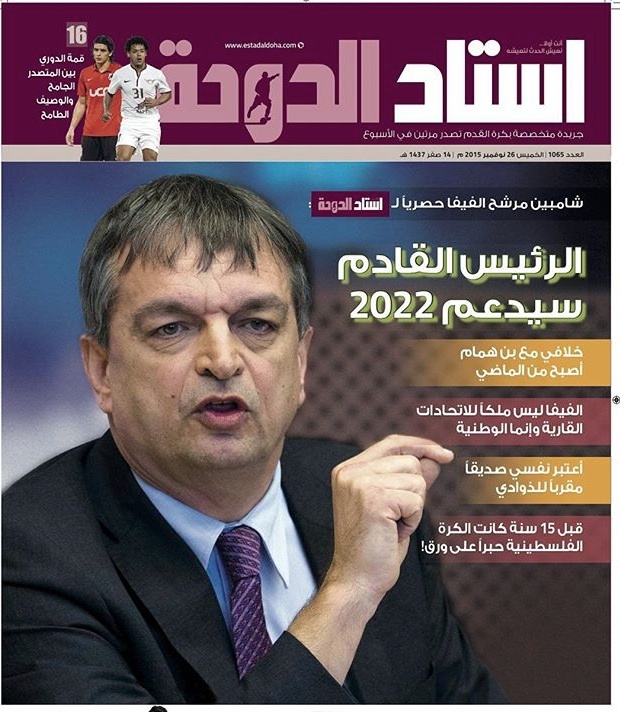 A review in the number of places at the World Cup with a view to change in 2026 with no confederation to be worse off. A review of World Cup bidding processes including lowering the cost burden for hosts of minor tournaments. 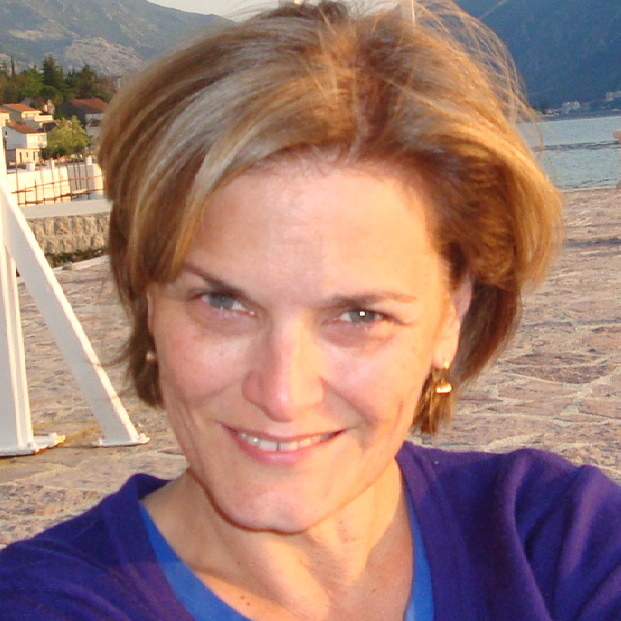 Publication of the Garcia Report in full – nothing about whistleblower protection. Publication of minutes of meetings, compensation of senior leadership, improved tendering processes. Term limits of two four-year terms for the President and Executive Committee. Greater involvement – not specified – of players, coaches, clubs and professional leagues. No mention of fans. Prince Ali talks the talk. His proposals are comprehensive and similar to those set out by #NewFIFANow and Transparency International for reform of FIFA. He knows that FIFA needs a leader with credibility to work with external authorities, sponsors, broadcasters, the 209 member associations and within FIFA itself to realise systemic and cultural change but it is unclear how or why he is the right man. Champagne’s manifesto was also prepared for his failed candidacy for May 2015, incorporated into a series of ‘monthly letters’. It is based on three pillars: of greater democracy and inclusiveness; a more equitable share of the wealth; and improved governance. He hasn’t wavered from this. Champagne’s manifesto and breadth of knowledge reflects the level of detail to be expected from someone who has worked on the inside of FIFA. Because he knows it so well, he may be a ‘chip off the old block’ in being a hands-on President in a similar vein to Blatter but there is little doubt about his competence. The accidental candidate – only nominated as a place-marker for Michel Platini, but now the ‘main man’ for UEFA – Infantino has stepped-up his campaign in recent weeks. He published his manifesto on 20 January and launched a website. He has been criss-crossing the globe with the help of a €500,000 grant from UEFA, all the while garnering stated support from member associations for his candidacy. Either he’s way, way ahead of everyone else or he hasn’t learned the lesson of Campaign 101: never trust the person who says they’re going to vote for you … especially not in football. Create new FIFA Council with increased representation to replace the FIFA Executive Committee as strategic and supervisory body. Separation of powers and functions: Establish clearly defined and balanced power structures between the sports-political and day-to-day executive roles – between FIFA Council and FIFA administration. Introduce term limits and other governance reforms. Include independent and respected voices on relevant bodies, while also ensuring an appropriate system of checks and balances. 1 Member Association = 2 Voices: 1 Voice to Vote and 1 Voice to Speak Out. Reflect the diversity of the FIFA Member Associations in the FIFA Council and the FIFA Administration. Expand and increase development programmes with tailor-made projects fitting the specific needs of each Member Association, while ensuring the highest levels of control and compliance. Make the voices of the players heard on all football matters and start an open debate with all stakeholders on the further use of technology in the game. Increase the number of teams at the World Cup to 40 for greater worldwide representation, as well as more generally increase participation in football at all levels. 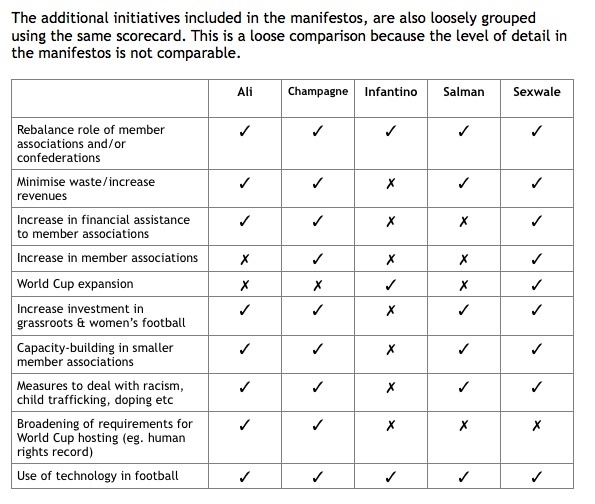 In contrast to Prince Ali and Champagne, Infantino’s manifesto is broad brush and non-specific – probably just how most football officials prefer it. 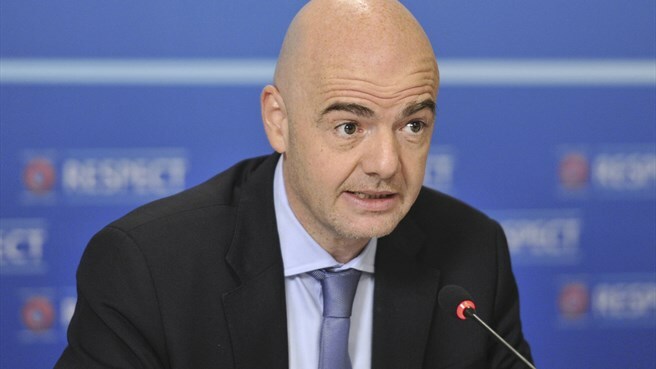 Even before he published his manifesto, Infantino had the support of the UEFA Executive and CONMEBOL which suggests the extent to which ideas really matter in this election. After initial phase, will become a non-executive President and will work to take the politics out of football. Separation of the commercial and business concerns of FIFA from football development activities of FIFA. Increase and evaluate development spending to ensure it is needs-based. (Presumably this means his own country, which has received more GOAL funding than any other country from 1999-2014, will receive less?). Increased emphasis on football development within FIFA as an organisation as well as throughout member associations, particularly grassroots, women and girls and referees. Develop stadia and security plan with each member association. Creation of a ‘Stakeholder Council’ to make FIFA more inclusive. Increase number of women on FIFA Executive and work with member associations to do the same. Partner with governments to place football on the curriculum to help build social inclusiveness. Review the number of teams participating in the World Cup with a view to change in 2026. Consider specific criteria/guarantees for tournaments on a case-by-case basis. Implement reforms of internal FIFA reform committee as a starting-point. Will also look at possibility of global sports anti-corruption agency. Secure FIFA’s finances by reviewing reducing costs and looking at new revenue streams. Seek advice on a “fool proof system” of controls on corrupt practices. Since our initial look at the candidates’ platforms at the end of November, someone has been busy on Salman’s behalf setting up a website and writing a manifesto, perhaps with one eye on our scorecard. It says many of the right things, whilst also studiously ignoring others. However, the noise around Salman’s candidacy is so loud and so frequent in respect of human rights, it is a challenge to reconcile those allegations with his manifesto. 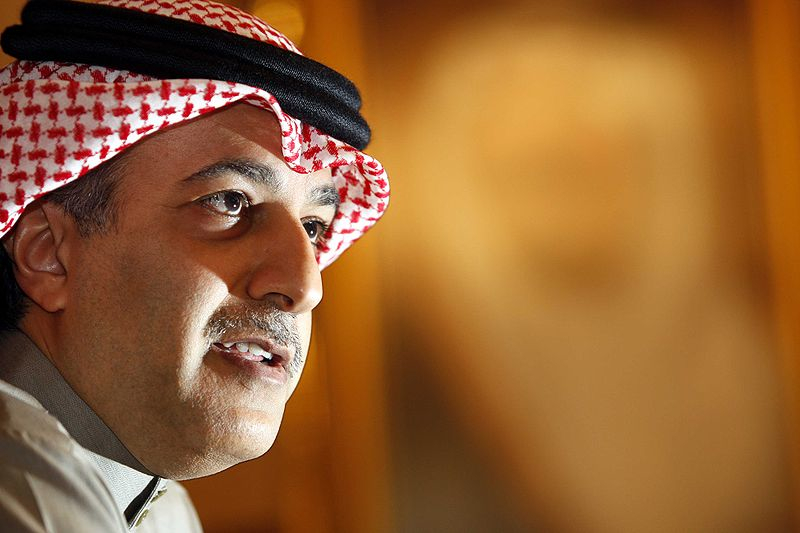 Who is the real Sheikh Salman? Sexwale’s manifesto appears to have picked-up on some key issues identified by Champagne as well as concerns advocated by sponsors and others, but dealt with superficially, with no level of detail. With no website and an inactive Twitter account, Sexwale’s candidacy has failed to make a mark and reports suggest his own association is wondering what’s going on. Perhaps he is less interested in the FIFA election than bigger issues that have defined his life, or perhaps his meeting with US authorities in December have put a dampener on proceedings. Sexwale is interested in ‘world peace’ – aren’t we all? – but unlike the rest of us, he penned an open letter to Vladimir Putin and Barack Obama last year. 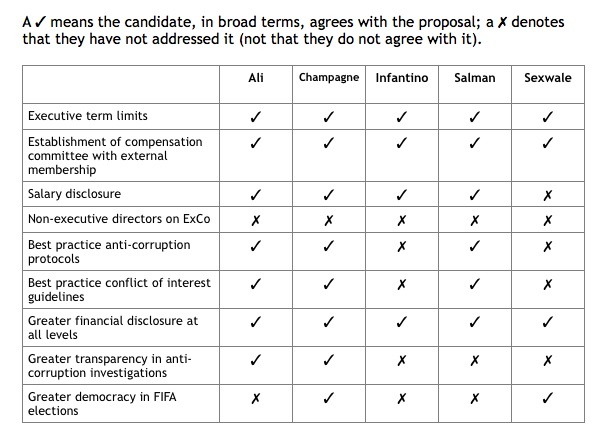 Using the nine categories devised by Professor Roger Pielke in An Evaluation of the FIFA Governance Reform Process of 2011-2013 in Managing the Football World Cup , here is the Sportingintelligence scorecard based on the manifestos of the five candidates. Note that these scorecards record whether a candidate in broad terms agrees with the proposal (first card) and then for the other 10 items, whether they even address them at all in their manifesto documents. In an effort to find out more about what the candidates believe and what they would do as President, Damian Collins MP wrote to the five candidates inviting them to take part in an online survey. Only two responded. You can see the results here. The candidates were also invited to a 2016 meeting of European Parliamentary members, MPs from other countries and stakeholders in Brussels in January for an opportunity to present their credentials and debate issues before a live global audience broadcast on ESPN. Three candidates were due to attend but it fell apart with less than 48 hours to go. James Corbett wrote about it in the analysis section of this project, here. Using the simple method of adding the number of ✓ for each candidate, the overall scores show Champagne on 17, (of 19) with Prince Ali on 15, Sexwale on 13, Salman on 12 and Infantino on 7. Champagne and Ali’s manifesto documents also have more granularity, are more comprehensive. 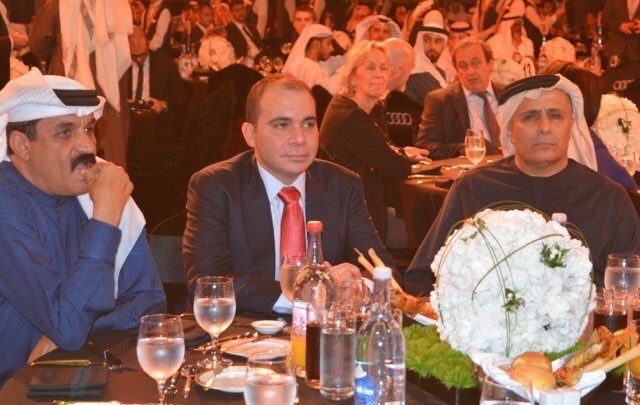 They are followed by Sexwale and Salman in terms of detail, with Infantino last in this regard. But judge that for yourself. All of the manifesto documents are available via the candidate profile pages linked above. It must be stressed. Just because a candidate has or hasn’t dealt with an issue doesn’t reflect they are ‘better’ than another candidate. So Champagne’s 17 doesn’t mean, per se, he is ‘better’ than Ali, or than Infantino is ‘worse’ than Salman, for example. It simply means candidates with higher scores have bothered to be more comprehensive in what they have covered in their manifesto documents. Despite the effort and the resources put into the five campaigns, there is little that separates the candidates. They are all prepared to make some concessions on ‘reform’ issues but none of them impress as inspirational leaders who can lead football out of the wilderness to which it has plunged. Some of them may be genuine; some may be well-meaning; some may be good Presidents or executive members in a different time and different circumstances. But not now. FIFA stands at a tipping point – and these men either don’t want to realise it or, worse, do not realise it. As we said previously, just like the World Cup votes on 2 December 2010, the Presidential election will not be won and lost on a contest of ideas, but on backroom deals. The biggest loser from the 2016 election is not one of the candidates, but football.